"Having Done All, To Stand": Exposing a Self-Proclaimed "Christian"
Have you ever been fooled by someone who claimed to be Christian, only to find out later that they were part of a non-Christian cult which, because of a horrifically flawed theology, meant that they actually believed in a different Jesus? This just happened to me with a dear Christian friend, or so I thought, one whose words about Jesus seemed so Christian, whose deeds and works seemed so Christian--ah, and that was the problem. Turns out this self-proclaimed Christian was a man who, in spite of using some of the right language about grace and Christ, actually had a flawed theology focused on human works and commandment keeping, making him no more Christian than, say, that cult of self-proclaimed Christians, the Mormons. The man I'm exposing today is named Paul. For years I, like many of my friends, thought Paul was a real Christian. Then I was jarred by reading this sentence from one of his letters: "Wherefore take unto you the whole armour of God, that ye may be able to withstand in the evil day, and having done all, to stand." Wait, he's saying that humans must be diligent and do things, doing all they can, in order to stand, as if Christians could fall from grace if they didn't do all that stuff involved with the "whole armor of God." Can that be a Christian doctrine? That sounded suspiciously like one of the most controversial, grace-denying passages of the infamous Book of Mormon: "For we labor diligently to write, to persuade our children, and also our brethren, to believe in Christ, and to be reconciled to God; for we know that it is by grace that we are saved, after all we can do." (2 Nephi 25:23) There it is, that jarring combination of human works with grace and salvation, as if our works played a role in determining whether we stand or fall, or receive salvation or not. When I read Paul's words in Ephesians 6:13 objectively for the first time, I began to see that I might be dealing with with a proto-Mormon non-Christian cultist instead of a true Christian. This was the beginning of a careful study of Paul's writings that show, in case after case, the Paul of the Bible doesn't believe in the Jesus of the Bible, but in a different Jesus, one who requires us to "do all," to be diligent, and even to wear "the whole armor of God" (including strange under-armor, perhaps?). Paul certainly used some of the right language: "By grace are ye saved," etc. A few times, yes, he uses acceptable terminology to seem Christian. But it's a thin veneer, a light dusting of makeup over the decomposing corpse of works whose stench fills so much of his writings. How have we been blind to this for so long? Look at the chapter where Paul's "having done all" statement comes from. Ephesians 6 begins with a call to obedience--obey is the second word--quoting some of the 10 commandments. Commandments, really? Then is a promise of blessings for obedience : "With good will doing service, ... Knowing that whatsoever good thing any man doeth, the same shall he receive of the Lord" (vs. 7-8). Verses 11-17 then deal with more impossible demands of Paul's flock, requiring them to put on the whole armor of God, spelled out in many details. These requirements for the believer point to impossibly high standards, such as those of verse 18: "Praying always with all prayer and supplication in the Spirit, and watching thereunto with all perseverance and supplication for all saints." Horrific. Simply horrific. Paul is all works, all prayer, all perseverence, all obedience, and precious little grace in this passage. It is one of many dark passages where Paul's real agenda of works is evident, in spite of a few nice-sounding passages about grace and Christ. But even when Paul talks about grace, a closer look shows that his agenda of works is often still there. That's the case in his closing verse: "Grace be with all them that love our Lord Jesus Christ in sincerity. Amen." Grace--not for anyone, but just to those who love the Lord in sincerity: that's Paul's code language for people who engage in the works of trying to follow Christ, of obeying commandments, of persevering, praying, and even wearing funny armor. Paul, I'm afraid, is pretty much a proto-Mormon. Paul teaches teaches a Gospel of works in which humans must keep commandments, obey (2 Cor. 10:5), and labor (2 Cor. 5:9; Romans 2) and in which God rewards us for our deeds, not our correct beliefs (Phil. 2:12). Paul teaches another Jesus who gives "glory, honor and peace, to every man that worketh good" (Heb. 2:10, and see the whole chapter for even more shocking statements)--in total opposition to true Christianity, where glory is only for God, and human works have no bearing on our salvation. Paul teaches us to "work out your own salvation with fear and trembling" (Phil. 2:12), while true Christians know that God does all the work and have nothing to fear because they know that their salvation is assured. The other Jesus that Paul follows "commandeth all men every where to repent" (Acts 17:30), echoing the Mormon doctrine of repentance, but the Jesus of the Bible simply teaches us to believe in Him. Paul claims that humans are literal offspring of God, a troubling doctrine identical to that of Mormonism. (Acts 17:28-29; Romans 8:14-16; Heb. 12:9). Paul denies or fails to endorse core doctrines of the Trinity. Nowhere does he speak of the one substance of God and Christ or other key metaphysical elements of the Trinity, nor does he acknowledge and endorse any of the official creeds that define true Christian theology. Instead he teaches that Christ and God are separate Beings, always speaking of them as if they are two beings, with Christ at the right hand of God. The Jesus of Paul has a physical anthropomorphic image--he claimed to have seen him, after all--with a body, a face (2 Cor. 4:6), hands, feet, etc. Paul's other Jesus is not the same incorporeal Being as the Father, but is a distinct anthropomorphic being that can be seen, and indeed is said to be "the express image of [God's] person" who "sat down" (yes, with the bogus body that Paul's false Jesus has, one can actually sit!) on the "right hand" of God (Heb. 1: 1-4). Paul teaches that man can become like God (Phil. 3:21; 2 Cor. 3:18) by obtaining a glorious, powerful, tangible body like God's. Horrific! In Paul's false Gospel of Fear, Christians can fall from grace. Thus, men should be worried (see the "fear and trembling" problem above) because they can fall from grace if they quit obeying. (1 Cor. 10:12-13; Heb. 3:12-14; Heb. 4: 11). The solution, in addition to all that fear and trembling and human works, is keeping Paul's impossible commandments to "Follow peace with all men, and holiness, without which no man shall see the Lord: Looking diligently lest any man fail of the grace of God" (Heb. 12:14-15). Christians, of course, know that God's grace can never fail, and that's all we need. In contrast, Paul urges believers to endure in running to the end of the race and to "strive for the mastery" (I Cor. 9:24-25) rather than merely receiving grace. In Paul's warped theology, humans must endure to the end, for God's full goodness is only for those who "continue in goodness" (Romans 11:22) and remain "stedfast until the end" (Heb. 3:13-14). Frankly, he seems even more extreme and works-oriented than the Mormons! Paul claims to have had visions, and in his First Vision, claims to have seen Christ. He also claims to have seen angels (and he even peered into heaven where he, like the Mormons, claims that there are multiple kingdoms or heavens!). Christians, of course, will recognize the occult and Satanic origins of such claims. Regarding the ridiculous claim of seeing Christ, Paul compounds his error by suggesting that his followers can also see God if they achieve the impossible goal of holiness. (Hebrews 12:14) Christians know that no man can see God. Further, Paul gives several contradicting versions of his First Vision with confusion in some of the details, but real Christians know that words from God will always be perfect and never cause confusion or uncertainty. In case after case, one can see common roots to Paul's heresies and Mormonism. Paul attempted to add new revelations and new scripture. It is troubling enough that he had the gall to claim to have had visions and seen Christ, but to then go and pretend to be writing scripture--well, it's just too much to stomach. As Moses explained in Deut. 4:2-4, no man can add or subtract to scripture. How are so many people being fooled by this stuff? Think, people! Paul speaks positively of the strange Mormon-like ritual of vicarious baptism for the dead (1 Corinthians 15:29)--a perfect example of relying on dead works instead of grace alone. Christians can be so gullible. We may like to be nice and accepting of others, so if a friend claims to be Christian and sincerely believes in Christ, we may be tempted to believe them. But just because someone claims to believe in Christ, strives to follow and worship Christ, prays and worships in the name of Christ, and even writes a few best-selling epistles about Christ, doesn't make that person a Christian. One's status as a Christian is not determined by what's in one's heart or even by a lifetime of seemingly Christian service, worship, faith, and prayer. Rather, it is determined by application of strict theological standards applied by true Christians as they carry out their responsibility of determining who is part of the exclusive circle of Christianity. These standards are based on the norms of Historic Christianity, meaning the standard and accurate form of Christianity that was developed in a portion of northern Europe beginning in the sixteenth century and in modern times perfected by and entrusted to select evangelical circles in the United States. To disagree with even one of their pure and standard doctrines is, of course, to believe in a different Jesus. And those standards, when applied to Paul, clearly and objectively require us to see past his alleged Christianity and condemn him as a cultist, as no more Christian than any other proto-Mormon or modern Mormon could be for his Jesus is, of course, a different Jesus. Adios, Paul. You fooled me for a while, but now you've been exposed. It's not the most pleasant part of the Christian journey, but facing the jeers of the world is something we need to be prepared for. Any aspect of our faith that requires faith is one that can seem crazy to others and may elicit mockery. Sometimes it comes from fellow Christians, sometimes from people who find faith of any kind ridiculous, and sometimes from people who just enjoy causing pain. What a world of difference there is between respectful disagreement and cruel mockery. May we be cautious that our own disagreeing does not become scorn or arrogant contempt. Photos were taken with Chinese paintings from a famous Chinese artist on display at the Hotel Baili in downtown Yangpu, a tiny little village next to a very industrial port on western Hainan Island, China. One of the things I like about China is the tendency to be modest, especially at beeches. Here's a scene from a warm, sunny day on the beautiful island of Hainan at a beach near Haikou on the north of the island. Beach attire was remarkably modest. OK, during the summer skirts tend to be too short for my tastes, but I don't think I've ever seen a Chinese woman with a bare midriff (though when it's hot, some of the men tend to role their shirts up, so we do have a midriff problem here). Overall, I'm pretty proud of China for relatively high standards of modesty. Fish therapy: this is a warm pool with lots of doctor fish that eat dead skin off feet. Shown below are a couple of feet being processed. Such a strange feeling. Made it hard not to giggle, it was so ticklish. Marriage in both the New and Old Testaments is a metaphor for the relationship we should have with God. His love for us is like the love of a perfect groom for his bride. The requirement for loyalty and fidelity on our part is also similar to the expectations expressed in marriage vows. Marriage, after all, is a covenant relationship, a two-way covenant. In entering into that covenant, one accepts certain limitations and exclusions in life, promising sacrifice, service, and complete loyalty, and thereby obtains great blessings and promises (especially true if you’ve managed to marry someone awesome like I did--I still can’t grasp why I should be so fortunate, but that’s another story). Latter-day Saints believe that when God gave Eve to Adam as his wife in the Garden of Eden, that nothing was said about this being a temporary arrangement. We don’t believe that marriage in God’s eyes is intended to last for just a few weeks or years. The marriage covenant as given by God does not come with the words “till inconvenience do you part” or with those more frequently expressed but still tragic words, “till death do you part.” We believe that marriage can be forever. Yes, of course we’ve heard the verse about how marriage does not occur in heaven. There is also no baptism in heaven. These ordinances are earthly ordinances that must occur here, but both, when properly done and with the right authority, can bring lasting eternal blessings. Heaven is not a place for dating. It’s not a place for people changing their affiliation in faith or in marriage. The ordinances of change, both marriage and baptism, are both ordinances of sealing what should be a permanent relationship and must take place before one can really move forward in the glories of eternity. Thank goodness, by the way, for the blessings of the restored temple where mortals can perform baptism for the dead and other ordinances to eventually give all mankind the fair opportunity to hear and accept the Gospel of Jesus Christ. Well, young couple, now you are married, married with God’s power, and since what God does lasts forever, we know that marriage lasts forever, too, so there’s nothing to worry about. No need to do anything, to exert any effort. No need to sacrifice or make any big changes in your life. Oh, sure, the changes will come naturally since you love each other, but there’s no sense trying to change anything about what you do, what you want, how you spend your time or money, etc.. God has done all the work that needs to be done in marrying you and nothing can change that. Once married, always married, you know. Now enjoy! Returning to marriage as a metaphor for our relationship with God, the writers of the Bible understood that our covenant relationship with God, like marriage, requires loyalty and effort on our part. It requires obedience and endurance to the end. Those in the covenant relationship can fall from grace. The Bible teaches that plainly and explicitly. The covenant relationship with God, not just in the Old Testament but also in the New, requires our obedience and faithful following of God. How tragic that some teachers and pastors would in essence give advice about God that is potentially just as harmful as that hypothetical bad marriage advice. One of the exciting things about LDS religion is the restoration of the ancient principle of covenants, even down to the level of detailed aspects of ancient biblical covenant patterns being restored beautifully (e.g., in the temple and in King Benjamin’s speech in the Book of Mormon)), patterns that were only recognized by scholars in the past century. Marriage, baptism, the LDS temple, and a knowledge of the real covenant relationship between God and man, with its implications for grace, salvation, and the tragically misunderstood role of human “works” such as obeying God and being loyal to God, are all part of this beautiful and impressive picture. Marriage is delicate and so is our relationship to God. Just as Paul urged us to “work our your salvation with fear and trembling” (Phil. 2:12), I would recommend that all you married folks work out your marriage with fear and trembling (and kindness and patience to boot) because we can fall if we are neglectful. Love can be lost. Trust can be lost. Grace can be lost. He that endures to the end, the same shall be saved. The covenant relationship of marriage likewise demands that we endure and stay faithful to the end. Then we’ll see that there isn’t really an end, but a glorious continuation. LDSFAQ: LDS Temple Ceremony: Derived from Masonry? Those with interest in either supporting or attacking the Book of Mormon using science can make a host of unintentional errors. Sometimes the errors come from misreading or misapplying the text, other times from improper understanding of complex scientific issues or other aspects of scholarship. We all like easy answers, especially ones that prove we are right, but life is often more complicated than that. Instructive lessons about the complexities of applying science and scholarship to the Book of Mormon come from the healthy debate occurring in the LDS community on Book of Mormon geography. In particular, look at Kirk Magleby's instructive "Implications of Radiocarbon Dating for the Credibility of the Book of Mormon and the Validity of Book of Mormon Geography Models." This is a rebuttal of arguments made by Ted Dee Stoddard about radiocarbon dating in support of the Book of Mormon. Brother Stoddard has provided many valuable insights into the Book of Mormon over the years. In this case, though, there appear to be some gaps requiring revision in the approach, just as there have been major gaps in my own thinking over the years, including some of my own technical and other publications, not to mention an occasional visionary patent that looks sorely misguided today. Magleby concludes by stating that "Ted Stoddard tries to argue that C-14 dating authenticates the Grijalva-Sidon correlation and invalidates the Usumacinta-Sidon theory. It is not that simple." It rarely is. From DNA and Book of Mormon population studies to details of geography or even the "simple" area of Arabian Peninsula locations, it's rarely a simple matter where one line of reasoning or one simple "fact" wins the day. Many details must be considered and competence in multiple fields needs to be tapped. We've come a long way, but there's still much to figure out. Yes, of course, I am writing this with the carefully obtained witness (in other words, BIAS) that the Book of Mormon is an authentic ancient book with miraculous origins, now seeking to better understand what it means and what it is. I am not trying to use science to determine if an angel brought Joseph Smith to the golden plates he translated with the power of God. "No pre-Columbian horses, no Moroni" - I can win that argument in a flash with the simplest logic and a single factoid of evidence - or I can explore the much more complex issue of what the text says and what I should expect to find scientifically based on it. Kudos to the Book of Mormon Archeology Forum for sharing the writings from these authors. The photo below is an untouched image (apart from being rendered in black and white and slightly cropped) that I photographed in Boise, Idaho last year. You are looking at stairs ascending a large tank boldly labeled "203." Start at the bottom of the stairs and imagine ascending, one stair at a time. 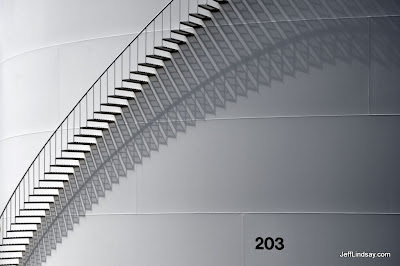 Don't rush your eyes across the image, but move methodically up the stairs, imagining how you would stand, how you would climb, how you would avoid falling. Continue until you get to the top. Click the image to see a larger version. Do the exercise, then read on. If you are like me and my wife, you may have been puzzled by some aspects of the image. The way things looked at first glance, and as you started your journey, might have changed along the way. Perhaps even dramatically. Perhaps you found that the logical conclusions you made as you began your upward trek were wrong, so wrong, in fact, as to be utterly upside down, completely the opposite of the reality that was in front of your nose the whole time. Perhaps it was only by looking at both the big picture and some intricate, easily missed details that you were able to properly frame the data--none of which needed to be discarded or retouched to comply with reality. If that happened to you, then you've just experienced what I'll call the 203 Effect. The 203 Effect is part of life. It's part of growing up intellectually, spiritually, emotionally. Recognizing that assumptions we brought with us may be wrong, that paradigms we relied on to interpret the world may be completely flawed, and that easily deduced conclusions made in our rush to ascend the ladders of wisdom may leave us hanging or falling unexpectedly from what we thought was a secure perch. If you feel like you're loosing your foothold, like the security rails you thought were there are gone when you reach for them, and that everything has turned upside down on you, stay calm. Hold on, reevaluate, challenge lazy assumptions and look with new eyes to see how things fit together, learn how others have made the trek safely, and continue your journey upwards. There's no need to fall into despair. Now of course this argument can be turned to many directions, as you wish. Here on this blog, I'm applying it, for example, to the good Christian who grew up "knowing" that Mormons were a cult and couldn't possibly even be considered Christian. Upside down! The argument can also apply to LDS folks who always thought the Book of Mormon described ALL ancient migrations to the Americas and covered the whole hemisphere in its scope, or to those who grew up thinking that prophets were nearly perfect or that we Mormons had all the answers. There's a lot of fallible humanity and human limitations mixed in with the revealed aspects of our religion. On the other hand, the argument especially applies to those who have things upside down because they see only the human weaknesses of individuals in the Church and miss that majesty and order of the divine structure that has been restored to earth that can lift and bless our lives more than any mortal remedy. 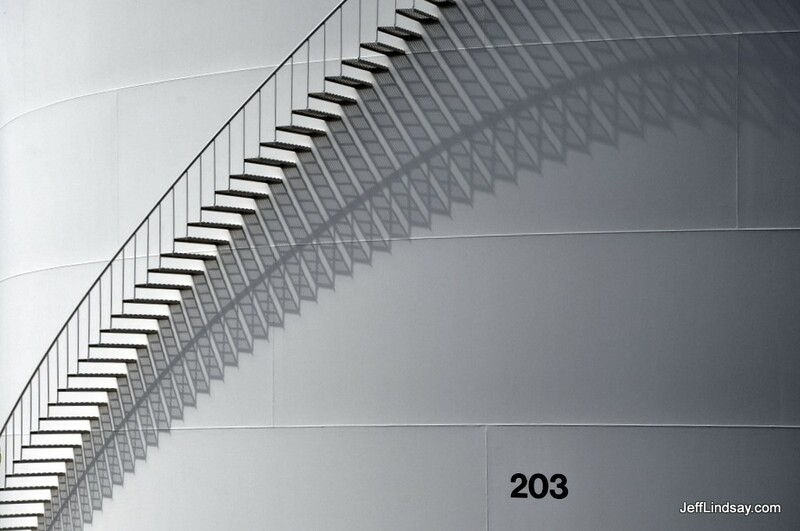 You may be so focused on the rust and the shadows that you miss the beauty of the stairs. Yesterday I discovered a balcony on the crazy massive produce market hidden on the 2nd floor of a building next to us. I had missed it for my first few months here because the entrance is an unmarked stairway that looks like it just goes into apartments. My wife discovered the sprawling, bustling, densely packed produce market, my favorite place to get fresh veggies and even meat. Yesterday, though, I finally discovered the balconies at the rear of the market that overlook a street just around the corner from us. As I stepped out and looked, I had a sense of despair as I saw a completely new and beautiful view of a complex, bustling, packed market on the street below, a huge market scene that I had missed before. The afternoon sun was perfect, the colors bold, the people so beautiful and varied, and the fresh fish, noodles, bullfrogs, spinning pancake wheels, butchers, sugarcane hackers, and shouting produce vendors on the street created too much wonder for one lens, one mind, or even one lifetime to explore. How dazzling that street was, what a gem old Shanghai is, and how great it must be for God to see and comprehend it all. How glad I am that Somebody is doing that, for no mortal can fully taste all this splendor. And if it were being missed, that would be such a shame. "Mormons Called Emerging Economic Tribe" is an old story about Joel Kotkin's notable book Tribes: How Race, Religion and Family Determine Success in the New Global Economy. Kotkins discussing new emerging economic tribes including Jews, the Chinese, the Japanese, the British and the Indians. But he also identifies the Mormons as having the characteristics of a global tribe. One thing about the global Mormon tribe that deserves special emphasis, though, is the high level of trust that exists in the network. At dinner the other night, I was gathered with a number of fellow tribe members. The discussion of Mormons as a tribe came up and people were observing how remarkable it is to outsiders that we can move to a new city, find out who the local Young Women's leader is, and instantly get a recommendation from this stranger for a baby sitter that can be trusted. What I find remarkable and wonderful is that I can travel to a new part of the world, find the Church, and instantly have people that treat me like friends, and who will gladly help me figure out how to get around and survive. And what I really like is just how fun those crazy Mormons are. Some people are surprised at how much fun people can have getting together without liquor, just socializing or sharing talents (ward talent shows--usually a riot) or joining together in community service. Such a great tribe. You'll be surprised at how diverse this tribe is. A few minutes with the Mormons of Shanghai, for example, will shatter many stereotypes. What an incredible group of people we have here from so many cultures and countries. I just checked our roster, and it turns out we still have openings in our tribe. Come join us! Google has a cool service for reading old newspapers at http://news.google.com/newspapers. Here's an example I found by searching for Book of Mormon articles. It's an interesting story from the Montreal Gazette in 1958 about some enthusiastic Mormons who put their lives at risk to see if a raft could drift from California to Hawaii. They succeeded, eventually, which proves, uh, that the Book of Mormon, um, or that Lehi, or maybe Hagoth, or um, well, I'm not quite sure what, maybe that ancient Nephites could have drifted away from California if they weren't careful. But I'm glad they survived. What I find especially interesting is how the Book of Mormon is summarized. Lehi, according to the journalist, used the drifting method to take the lost tribes of Israel from the Red Sea to Central America. Pretty close, except for the drifting (not necessarily drifting: the use of the Liahona on the vessel implies directional control), the Red Sea (they never set foot in that body of water as far as we know, and depart from the eastern coast of the Arabian Peninsula), and the lost tribes (the lost tribes were lost before Lehi's day and he wasn't leading them anywhere, though he was part of the House of Israel himself, a descendant of Joseph). I'll give the article a B+ for fewer errors than average in Book of Mormon coverage. Yes, I've got low standards (when it comes to expectations of journalists, that is). I do understand the desire to demonstrate that ancient transoceanic voyages were possible. There really is quite an interesting story about the intrepid Book of Mormon fan, Devere Baker, who sacrificed so much to demonstrate that ancient transoceanic voyages might be possible. See "DeVere Baker and his Ocean Rafts" by Warren Aston. In this regard, Thor Heyerdahl's gutsy work with the Kon-Tiki expedition deserves attention. I'm not sure I grasp what Baker's later work demonstrated beyond Heyerdahl's, so if you're more familiar with the story than I am, please let me know. Although the Book of Mormon generally agrees with the King James Version (KJV) of the Bible both in its acceptable scriptural idiom of translation and in its direct quotations from Isaiah, Joseph Smith's translation of the Isaiah texts in the Book of Mormon sometimes differs. At 2 Nephi 20:29, for example, Joseph dictated Ramath instead of the usual "Ramah" of the parallel King James Isaiah 10:29. Indeed, there is no "t" in the Hebrew text, the Greek Septuagint, or even in the Syropalestinian Aramaic version. The "t" appears, however, in the later Jewish Aramaic translation known as Targum Pseudo-Jonathan, as well as in the Christian Syriac Peshitta version. The words there are Ramata and Rameta, respectively (as is also evident in the Old Syriac Rametha for New Testament Arimathea in Matthew 27:57). Neither source was available to Joseph. Another difference from the KJV came when Joseph was dictating from Isaiah 48:11 in 1 Nephi 20:11. Among other things, Joseph added an "it" that does not appear in the Greek or Hebrew texts. However, the "it" is in one Syriac manuscript, in one Jewish Aramaic Targum manuscript, and in a scribal correction to the large Isaiah Scroll from Qumran Cave One (the latter being the earliest Hebrew text of Isaiah). At 1 Nephi 7:11, the Original and Printer's Manuscripts of the Book of Mormon, as well as the 1830 edition of the Book of Mormon, all use the word how, which was changed in the 1837 and all subsequent editions to read what. However, even the King James translators could not decide, in translating a closely similar phrase in 1 Samuel 12:24, whether how or what was a more accurate translation of the Hebrew relative particle 'asher. They thus placed the one in the text and the other in the margin (the reasons for marginal readings are explained at length in the introduction to their 1611 edition of the King James Version). Exactly the same variant readings occur in the texts we have of the Title Page of the Book of Mormon. There is an interesting confusion between things and words at 2 Nephi 6:8 and 33:4. While the Printer's Manuscript reads things at both locations, all editions (except the 1830 at 2 Nephi 33:4) have changed this to read words. Either variant is a good reading, and the Hebrew word debarim is accurately translated either "things" or "words." The 1981 edition of the Book of Mormon has returned for the first time to the reading of the Printer's Manuscript father (singular) at Jacob 3:5, which of course refers directly to Lehi in the preceding Jacob 2:27, 34. The plural form fathers, which had been mistakenly used in all editions since 1830, suggested that Jacob attributed a restriction on plural marriage to earlier Israelite fathers, whereas historical evidence of any such legal restriction before Lehi is lacking. Since Isaiah 29 and 2 Nephi 27 were mentioned above, let me point out that critics sometimes have argued that Nephi's many additions to Isaiah 29 in 2 Nephi 27 (or more broadly, in 2 Nephi 26 and 27) is unscriptural, contrary to Jewish tradition, a case of obvious forgery by Joseph Smith, etc. In reality, it is a good example of a Jewish prophet and teacher of the Jewish scriptures showing how a man of God applies scriptures prophetically, showing us how to "like them unto us." Grant Hardy pointed out that Nephi's complex combination of his own words with those of Isaiah could be viewed as akin to the rabbinical "midrash." No, this is not something that comes from wearing your belt too tight. It's related to the Jewish tradition of providing commentary and interpretation of scripture. Grant Hardy explains in his short essay "2 Nephi 26 and 27 as Midrash" and more fully in his chapter of the magnificent book, Reading Nephi Reading Isaiah: Reading 2 Nephi 26–27, edited by Joseph M. Spencer and Jenny Webb (Salem, Oregon: Salt Press, 2011). Yes, what Nephi does with Isaiah 29 is so interesting and instructive, and so related to Book of Mormon themes and to other parts of the text, that there is an entire book written on this topic with some essays definitely worth pondering. I hope you'll enjoy it and come away with a better feel for who Nephi was and how he approached scripture as a reader, an expositor, and a prophet. So who was Nephi, or rather, who wrote the text of First and Second Nephi? I'll offer a view based on my study of his writings: he wasn't a 19th century farmboy, nor a 19th century scholar, nor a 19th century expert in the Bible. He was a prophet of God from a troubled family in ancient Jerusalem where he suffered years of abuse from his brothers and struggled all his life with the anger and frustration this caused. He was a brave man who endured a difficult trek through the Arabian Peninsula where he described directions and locations that make sense 2600 years later. He crossed the ocean and took part in leading and teaching people in an incredible adventure in the New World. Most important of all, he was a prophet of God who communed with angels, had visions, and even saw the future Messiah and stood as a witness for the Savior, Jesus Christ, leaving us his sacred writings and commentary to help being us unto Christ. I often put my foot in my mouth, so my latest experience in China was a refreshing but surreal change of pace. At the end of a valuable but challenging business trip to a small, town on Hainan, the large island off the southern tip of China, I arranged for my wife and I to stay at a pleasant hotel on near the beach by the large and much more developed, more foreigner-friendly city of Haikou. Little did I know that the hotel I selected (the Tienyou Grand) based on location and its relatively low price (under $100 a night) would be one of the most delightful I’ve ever been to, featuring not just beautiful grands, English-speaking staff, perfect seafood and comfortable, beautiful rooms, a marvelous breakfast buffet, a gym, and a bowling alley(! ), but also multiple pools of water from volcanic hot springs and featuring something I’ve heard of but never experienced, “fish therapy.” These spa-like facilities come at no extra charge. As my wife and I went out to the hot springs pools lat night after a walk on one of China's most beautiful beaches, I noticed a sign pointing to “fish therapy.” Curious, we went there and were surprised to see that it was simply a pool one could get into for free. We climbed in, joining four other jovial Chinese citizens (I think most were locals, not actually guests of the hotel, but don’t tell anybody!). Within seconds, a dark cloud of small fish encircled my calloused feet and began nibbling. It was such a strange feeling. Hundreds of small raspy mouths were eating away dead skin on my toes, my heel, the soles of my feet, and everywhere else with tasty dead skin. I couldn’t help but laugh with the intense tickling sensation. Some other women in the pool kept reminding me not to move because that would drive the fish away, but suppressing the instinct to kick and the reflexes to twitch was difficult. So surreal. My feet have a number of problems often resulting in callouses and bunions, but the little critters did a remarkable job of taking a lot of the dead skin off. It really is a remarkable therapy. The great thing is that these fish know when to stop. They don’t eat the live skin. They don’t cause cuts and bleeding. They just nibble away at the dead stuff and make feet feel better and younger. You really should try this in a place with clean water and healthy fish. But it was hard not to think about their distant cousins, the piranha, during this experience, hoping that none were in the pool by mistake. Those therapeutic fish, Garra Rufa, are sometimes called doctor fish. They are remarkable little cleaners that seem so perfectly designed to serve mankind by eating away dead skin from feet. They were discovered in pools in Turkey and have now become popular in several parts of the world. Unfortunately, bureaucrats in the US have made it difficult for those wishing to provide fish therapy. Regulations in some places call for disinfecting foot therapy tools after every use, and while frying is an effective way to sterilize the doctor fish, they don’t work as well afterward. All the things people do in the US to protect people from themselves can really hinder progress. As I consider what a wonderful, therapeutic experience I had with these doctor fish, it’s hard not to think that they are one of the countless little miracles that God has placed here in this mortal world for our benefit, along with a few less enticing miracles like piranhas and flesh-eating bacteria. It’s mortality, but it has its treasures. So many of them! What dazzling fruits of the Creation I've experienced here in China and everywhere else. So much to be grateful for, even the little gift of being eaten alive.